Suitable for infants from birth if combination feeding if baby is not being breastfed Feeding guide and preparing a feed Approx. age: Up to 2 wks; Approx. weight 3.5kg, 7 3/4lb; No. Feeds per 24 hrs: 6; Single feed: 90ml, 3 fl oz Approx. age: 2-4 wks; Approx. weight 3.9kg, 8 1/2lb; No. Feeds per 24 hrs: 5; Single feed: 120ml, 4 fl oz Approx. age: 4-8 wks; Approx. weight 4.7kg, 10 1/2lb; No. Feeds per 24 hrs: 5; Single feed: 150ml, 5 fl oz Approx. age: 8-12 wks; Approx. weight 5.4kg, 12lb; No. Feeds per 24 hrs: 5; Single feed: 180ml, 6 fl oz Approx. age: 3-4 mths; Approx. weight 6.2kg, 13 3/4lb; No. Feeds per 24 hrs: 5; Single feed: 180ml, 6 fl oz Approx. age: 4-5 mths; Approx. weight 6.9kg, 15 1/4lb; No. feeds per 24 hrs: 5; Single feed: 210ml, 7 fl oz Approx. age: 5-6 mths; Approx. weight 7.6kg, 16 3/4lb; No. feeds per 24 hrs: 5; Single feed: 210ml, 7 fl oz Approx. age: 7-12 mths; Approx. weight -kg, -lb; No. feeds per 24 hrs: 3; Single feed: 210ml, 7 fl oz Assumes weaning at 6 months. Your baby may need more or less than shown in the table, which is provided as a guide only. Please follow these instructions carefully Failure to follow instructions may make your baby ill. 1. Wash hands and sterilise all utensils according to manufacturers' instructions. 2. Shake bottle well. Pour the required amount of milk into a sterilised feeding bottle. 3. Aptamil Profutura First Infant milk can be given at room temperature or warmed if desired. If warmed, check temperature of feed. IMPORTANT NOTICE<br>Breastfeeding is best for babies. 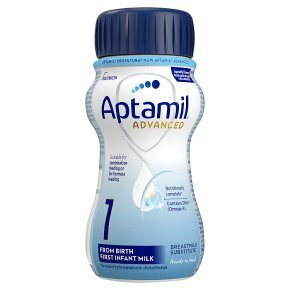 Aptamil First Infant milk should be used on the advice of a doctor, midwife, health visitor, public health nurse, dietician, pharmacist, or other professional responsible for maternal and child care. When bottle feeding do not allow prolonged or frequent contact of milk feeds with your baby's teeth as this increases the risk of tooth decay. Ask your health professional or dentist for advice. Make sure your baby's teeth are cleaned after the last feed at night.